Like other traditional art forms of India, block-printers of Bagru, too, have been fleeced by middlemen and traders. Through community initiatives, however, the printers are equipping themselves to work on their own terms. Bright printed fabrics spread at the common village ground that once formed a farmland, printing units at nearly every household with pits for dyes, the sight of artists printing with wooden blocks under tin roof in the severe heat of Rajasthan, occasionally resting their eyes and minds, and the wood carvers sitting on the threshold of their workshops piercing their way through the design on the block; this makes for a regular morning at Bagru, a village on Jaipur-Ajmer road in the arid state of Rajasthan where the traditional Bagru block printers reside. Nearly 30 kilometres from Bagru, in the state capital Jaipur, is the factory of Anokhee, a well-known apparel and lifestyle label that uses traditional crafts such as the block printing, primarily from Rajasthan, and boasts of employing the local artists. Spread across a vast area, the factory has definite units for production and quality control. In its air-conditioned environs, it employs nearly 300 workers, predominantly women and outsources work to approximately 2,000 people in its network that include printers, dyers and washer men. Apart from the manual labour, the heavy machines and equipments support the methodical mass production. The enterprise has systematically segregated its work and has quality checks at all stages of fabrication. While Anokhee is an example of enterprise working with the artists and involved in the production, there are numerous retailers and export houses that purchase from the printers to sell at exaggerated costs. An indigo Bagru print cotton stole, for instance, would cost INR 800 in the village itself and nearly INR 2,000 in a store in Jaipur, merely 30 kilometres away, indicating the fat margins made by the middlemen or the traders, leaving the artisans themselves high and dry, even if the demand for their products has been rising across the nation. This is an issue not just with Bagru’s artisans, but indeed a nationwide issue. Some artisans have begun to eliminate the middlemen, connecting directly with the customers for maximising their returns. According to the local legend, Bagru printing began at the instance of two royal families at Bagru who invited the artist community called Chhipa from Sawai Madhopur to Bagru, nearly 400 years ago, to print fabrics exclusively for them. Sanjaria river, in the vicinity, gave the nomadic artist community a motivation to accept the offer and settle down. With the growing interest of the villagers, the art flourished further. The patterns of Bagru also traditionally denoted marital status and caste; gardeners wore cloth patterned with flowers, widows could not wear a dagger pattern and middle-aged women wore marigold patterns. The villagers also engaged in the barter system. Farmers, for instance, exchanged food for Bagru prints. In the early 20th century, demand for block prints dropped with the advent of cheaper, machine-made fabrics. However, Bagru had a revival in the 1960s, with the arrival of western designers as part of the “hippie trail” who began using hand- block printed textiles to make modern, fashionable clothing giving Bagru’s artisans an export market. Viewing its demand in the west, many companies such as Anokhee and Aravali Exports entered the export business for a share of the pie. Anokhee worked with printers in Sanganer, Jaipur and other natural dye centres such as Jahota, Ajrakhpur and Balotra. “The work is spread across various printing villages/towns although our relationship with Bagru is the longest standing,” says Rachel Bracken- Singh, creative director, Anokhee. From merely being an export house, the company extended itself to production and retail business in 1984 with its first shop in Jaipur, thus tapping the domestic market, and now has 27 outlets across the country. Sanganer and Bagru, the two distinct styles of block-prints of Rajasthan, adorn garments, bedspreads, curtains and linen among other household decorative items. While Sanganer prints are mostly on the white or off-white backgrounds, Bagru that also enjoys the GII (Geographical Indication of India) status applicable for any art form more than 150 years old, are predominantly on red, black or blue backgrounds. Another difference lies in the usage of natural and chemical dyes. The Bagru block print fabrics boast of natural colours even in the modern times. However, the time and the labour that goes into traditional Bagru, often act as limitations in keeping it authentic. “The very traditional motifs done with very small blocks take long to produce and hence have limited supply and tend to be very expensive. Yet demand remains very high,” says Rachel. To meet the rising demand, some artisans were tempted to use synthetic dyes and modern blocks, thus diluting the authenticity of the art. But there remain a section of dedicated printers who follow the traditional ways and take initiatives for the community to preserve the authentic art. 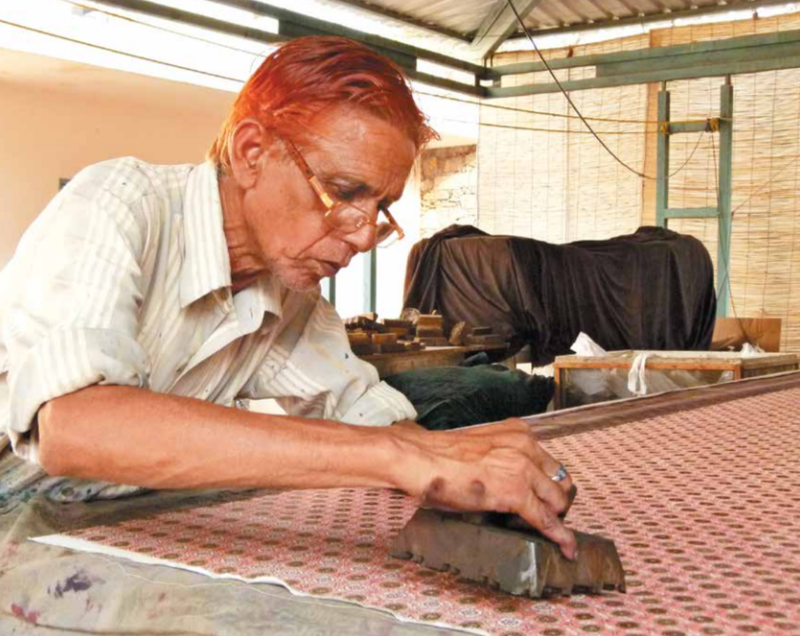 “My father would print 35-40 metres of clothes every week to sell at the weekly fairs in Jaipur,” says Bagru artist Vijendra Chhippa, who founded his social enterprise Bagru Textiles in 2007 at Bagru. “I started learning and helping my father with printing when I turned 13 and after he died in 2007, I dedicated myself to the art completely,” says Vijendra. He founded Bagru Textiles, a firm that claims to be based on fair trade, transparency and use of natural and eco- friendly material, and employs 16 fellow artists from the village. Unlike the traders, Vijendra links the artists in his network to the clients directly and pays more than double the amount of standard wage fixed by the government. Traditional prints of Bagru are motifs of flowers, leaves and customary designs, while to keep up with the modern times geometrical patterns and shapes are also imprinted. Predominantly, two kinds of wood is are taken into use while preparing the blocks – Sagwan (teak) and Sheesham (Indian Rosewood), among which Sagwan is the more expensive, soft and durable. Because it is hard, intricate and detailed motifs are carved in Sheesham. Depending on the intricacy of the design, the carvers take one or two days to prepare a block. Additionally, from treating the base cloth with fuller’s earth (multanimitti), soaking it in turmeric (haldi), to stamping the cloth with patterned blocks of wood using natural dyes of earthy hues, Bagru’s prints are fine examples of eco-friendly textiles and printing practices. Natural colouring agents such as alum, turmeric, pomegranate, dried flowers and indigo are used to add colourful designs and motifs to the fabric. Blue is derived from indigo, green from indigo mixed with pomegranate rinds, red from madder root and yellow from turmeric. These colours rest in the pits at home-based workshops of the artists. Black is derived from worn-out iron horse or camel shoes soaked in water, red comes from gum paste and alum, and maroon is a result of mixing black and red. Nearly 15 master families are expert in printing, from creating colours to the finished product. The wooden blocks filled in mud are stamped on the fabric before dying to prevent the designs to get coloured. Later they are soaked in natural dyes for 10 hours post which they are beaten on a stone to remove impurities. Owing to the dry conditions of Rajasthan and to prevent the wastage of water, the water used in the printing process is recycled and reused until it is no longer usable when it is used for irrigation. The dyes, being natural, do not harm the soil. The primary reason for the settlement of the Chhipa community in Bagru was the river that supported the printing requirements. Ironically, with the drying of the river in 1981, scarcity of water has become one of the key challenges now. “The water here is 110-115 feet below the surface and every year it goes down by one metre,” concerns Vijendra. Under such circumstances, the art may not last beyond the next 10 years, according to him. Of the 50,000 people in the village, nearly 5,000 are directly involved in printing while 10,000 are involved in supplying and dyeing. During summers, farmers also turn to printing for livelihood. The printing is the yearlong source of income, with the exception of monsoon that stops the process. While the popularity of the Bagru prints has passed the test of time both in India and overseas and the trade has flourished, the same can’t be said about the artists who work for the traders and exporters. To add to this, a textile park was inaugurated at Bagru in 2013, consisting of printing units that employ the local artists. That too compromised both the quality and the wages of the artists. “The block printers receive regular, ongoing work using the techniques and dyes that they have identified with for generations. It is important for any craftsperson to feel the security of year round and long-term work. As a company, we have always endeavoured to provide constant employment in this way,” she adds about Anokhee. But this is not reflected in the outlook of the artists themselves. With the hard work being unflattering to the livelihood, artists prefer their next generations to study and drift away from the hardships of the life that it proclaims. “I don’t want my children to continue this for living. 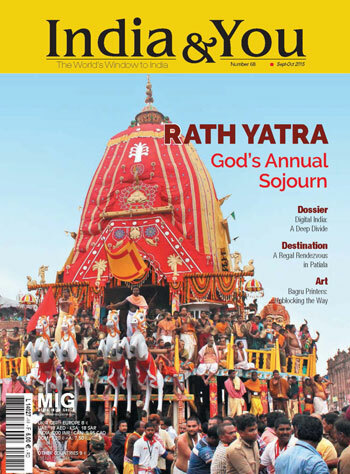 However, we are working in the direction of increasing awareness through village tours, workshops and offering fellowship programmes for the continuity of the art,” says Vijendra. While this may not be enough to uplift the circumstances of the artisans, the community’s initiatives to promote the art has worked in their favour as overseas designers and buyers show interest. With the use of technology and internet, some artisans have begun to find buyers afar who send them contemporary motifs and products to design, thus showing a ray of hope.